Campaigners angry about changes to hospital services in east Kent have confronted NHS bosses. 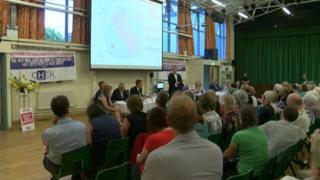 Concern for Health in East Kent (CHEK) organised a public meeting on the future of Kent and Canterbury Hospital. From Monday, patients who require urgent care for heart attacks, stroke and pneumonia will be taken to hospitals in Margate or Ashford. East Kent Hospitals NHS Trust said the changes would be temporary but CHEK fears they could become permanent. Following the meeting in Canterbury on Friday night, which was attended by about 300 people, CHEK chairman Ken Rogers said the chief executive of the trust, Matthew Kershaw, should resign. Local residents are also campaigning for a new hospital and medical school to be opened in the area. Mr Kershaw said he had to provide the best possible patient care with the resources available. "I have to also make sure we continue to provide safe, effective services for our patients, and to do that we have to make some difficult decisions, and that's what we've done. "We've not done that because we want to undermine the health service. "We've done it because we want to protect high levels of care for our patients, and the right sort of environment for our staff to work in," he said. Earlier this month, hundreds of people marched through the streets of Canterbury in protest at the changes, warning "people could die". The trust said Health Education England had asked it to move some junior doctors to hospitals in Margate and Ashford as there were not enough consultants in Canterbury to train and supervise them. It said the changes would only affect up to 50 of the 900 people who use the hospital in Canterbury every day, and anything permanent would not happen without public consultation.